Each school in the Trust retains its own local representation, a School Advisory and Improvement Group (SAIG). The SAIG is a development of the traditional Governing Body, and responsible for standards, curriculum, community and safeguarding. The SAIG has a Chair and work alongside the management team of that individual school. Support and challenge and central services are provided for all our schools under the leadership of Mr Mark Adamson, the Chief Executive of the Trust. The support, challenge and central services are designed to allow school leadership teams to focus more thoroughly on pupil achievements and welfare. The school management teams and SAIGs are held accountable by the EAT Trustees. It is the responsibility of the Members to appoint our Trustees. The Trust is fortunate in having a highly skilled and committed group of Members and Trustees, drawn from all walks of life, who regularly oversee the work of the entire Trust and who are insistent that all pupils in the Trust achieve their very best. Address the educational performance issues in our Trust schools – the improvement of all schools is important, not just borderline cases or schools in special measures. Provide teachers with the tools to guarantee their success in ensuring our pupils excel. Our quality assurance and improvement frameworks and target setting procedures are aimed to maximise the potential of each and every young person and employee in all schools. Our rigour will sit alongside a relevant curriculum, which will improve outcomes in our organisation. Utilise the new organisational opportunities available through the Academies programme to increase the membership of the Trust. Develop a new model of learning, fit for the 21st century, which meets the children’s needs. Co-construct a workable model with each school, taking into account their individual needs, rather than impose a model. Promote an all-through curriculum model, easing transition at all points from 2 to 18. Be creative in the process of attracting the highest caliber of staff to our Trust schools and ‘grow our own’ to aid our sustainability. Ensure our pupils are literate and numerate and have good IT skills. We aim for them to be encouraged, at all ages, to be; problem-solvers, collaborators and resilient learners who accept challenge. Aspire to excellence; we are not satisfied with comfortably improving. We want to be the best that we can be, in terms of the success and progression of our pupils and in the provision of our services. Concentrate on education and the individuals in our organisation. We are set up to allow our academic staff to focus on students and our support staff to focus on customer service, to provide an inclusive education to all pupils. Encourage all parts of our organisation to see themselves as equal partners with a shared common aim as described above. Collaborative working will provide opportunities for progression across organisations for staff. Ensure there are relevant and quality systems, processes and procedures required to ensure that individual schools and their staff are both supported in achieving excellent results for their pupils and also monitored and evaluated so that their own performance is maximised. Establish performance measures, agreed and monitored on a regular basis by the Chief Executive Officer and the Heads of each school and termly reports will be made to the Trustees. Our performance measures will also include an element of aspiration designed to enable pupils to be ready to access the next stages in their school journeys. Find opportunities to work with partners locally, regionally and nationally in educational and community initiatives. 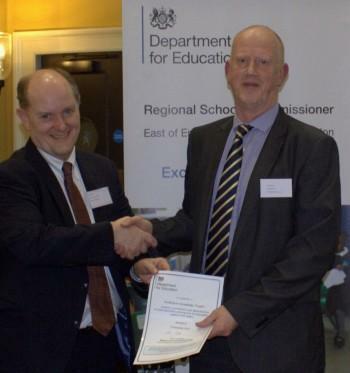 Founding CEO, Mr Hull receives a certificate from the DfE in recognition of the Trust’s work from the Master of Selwyn College Cambridge. Mr Hull retired as CEO on 31st August 2018.